It’s this type of morning comfort food that inspired me to wear my oatmeal colored V-neck sweater today. This winter essential is the fashion equivalent to a warm bowl of oatmeal. It’s super soft, comfy, and cozy. 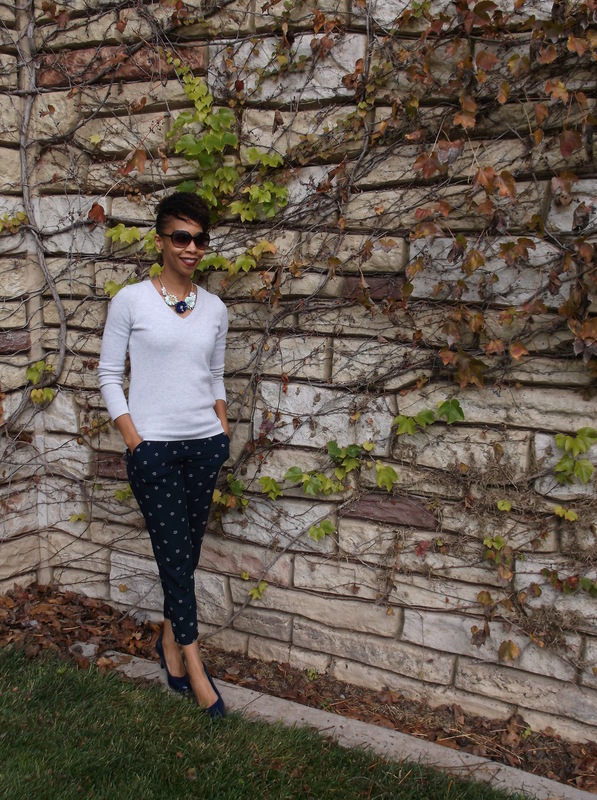 I decided to wear the sweater with loose fitting navy blue ankle pants that are flanked with little white flowers. The dark pants bring out the flecks of color in the sweater creating an overcast-like color pallet. I chose a floral statement necklace that mimics the flowers in the pants and adds an accent color. I finished things off with low navy blue heels to aid in the overall dressy casual look. How will the “most important meal of the day” inspire your look? Thank you, Lena! Yeah, I couldn’t pass up the necklace up at that price. Enjoy your week, love! xo! This outfit is so nice it’s like hamptons preppy and then your awesome hair gives a little edge and sass. Love it! Nice look! Especially love your necklace that looks so nice and cute! Thanks, darling! The necklace really does add to this outfit. Happy Holidays! xo! I love your necklace! Such a pretty and comfy look! This outfit is so cute and looks so much more expensive than Old Navy! I think the fabulous styling makes it seem so much more luxurious! Thanks you, love! Happy New Year!! xo! Thank you, dear! Those pants were a great find. Very versatile and super comfortable! xo!